War is unforgiving. Comprised of many battles and confrontations, it fatigues everyone involved both physically and maybe even more so mentally. Now multiply that mental fatigue by 100, and repeat it daily in the exact same fashion. The result is Edge of Tomorrow. In this film, malevolent alien beings knows as Mimics have engaged in a war with humans in continental Europe. They are flat out dominating us, and little hope is on the horizon. Major William Cage (Tom Cruise) isn’t a soldier, but he is a smooth talking guy the military has effectively utilized. It is his unlucky day though, as General Brigham (Brendan Gleeson) orders Cage to the front lines in France after a heated meeting. Shockingly, the Mimics seem to have correctly anticipated a human assault, and consequently many casualties are suffered. Cage manages to take down an Alpha mimic during the ruckus, but the blood emitted from the downed being burns and kills him. Except he wakes up the next morning, and the next, and the next, and relieves the same battle over again. A gritty female combat soldier (Emily Blunt) is the only person who can help him. Cage possesses the literal power to change the course of this war, but it is going to take a lot of sacrifice and careful attention to detail to do so. 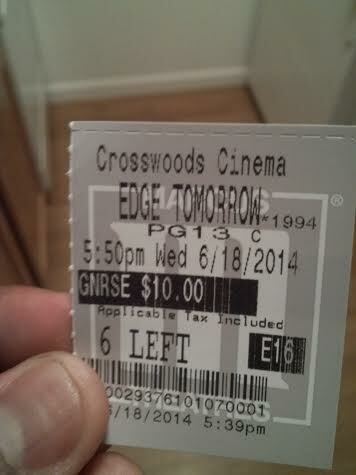 It is a shame that Edge of Tomorrow isn’t doing huge box office numbers domestically. As a pure summer movie, this is infectious entertainment. It may not feature the traditional lens to society that many sci-fi films yield, but there is more than enough here for a great time (it’s the summer anyway). EoT’s story is rather simplistic. There is a war, featuring aliens and humans squaring off for their existence, with some very logical time travel elements interspersed. It truly embraces the science fiction roots in visual style and setting, just minus the social commentary. With this review being late, this has most likely already been said but it will be said again: Edge of Tomorrow feels like watching a video game on the silver screen. This sounds like a negative, but it is in fact a compliment. To me personally, it resembled some of Mass Effect 3 along with a dash of Gears of War and a hint of Call of Duty. The war witnessed came across as intense and as realistic from a futuristic standpoint as could be, with all praise to the cinematography and presentation. Director Doug Liman has done a magnificent job framing all of the action in fluid and clear detail. Each bullet, collision, Mimic rip, etc. is captured in full, all without wonky camera angles or unneeded effects. He only has a misstep at the end. It is a little too muddled visually (and scriptually) that it ends up hitting an anticlimactic note. Still, along with Godzilla, this shares the mantle for best looking movie of the year so far. Supplementing the cinematography is an impressive orchestral score that raises tension when needed and further evokes the grim reality of the war. With its premise, one would think that reliving the same day a la Groundhog Day would make watching EoT a tedious drag after a while. Nothing could be further from the truth. The movie manages to feel fresh each time it loops because it hardly ever starts right at the beginning of Cage’s day. It sort of progresses like a video game checkpoint; once Cage has “mastered” a certain section, it really isn’t seen again. A nice decision to carry out the events this way, as if the loops were shown at the start of each day, it would have been a bore after a while. Carrying out the premise this way is also proof that the filmmakers thought highly of the audience’s ability to think for themselves, a nice feeling to have. It is never shown how many times Cage has to relive this day. All we know is that he is able to get slightly further each time, but it can be imagined that maybe 40, 50, or hundreds of times were needed to master the previous section, and another 40, 50, or 100 times to master and advance the next section. Thinking about relieving that is mind-blowing. 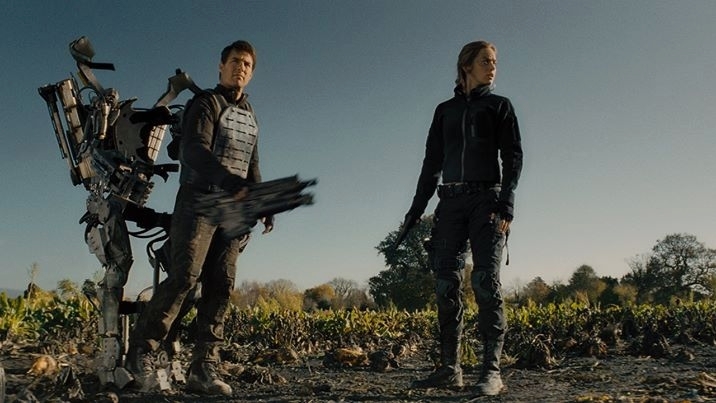 Edge of Tomorrow is bleak, but not completely throughout. Seeing Tom Cruise perish over and over again is sort of depressing especially once you truly think about how many times he has to live, die and repeat. But honestly, it is laugh out loud funny in parts, however morbid that may sound. It keeps the film light enough in spite of its hero’s predicament. This may be a slight indictment of the other comedies I’ve viewed in theaters this year, but I easily laughed hardest during this film. There is something about how Cruise sells his situation through grunt or quip before execution that is nearly impossible not to laugh hard at. With this starring role, Cruise still shows he has what it takes to lead a blockbuster. Whether you care for the man or not, his commitment to his roles is undeniable. He has always been hit and miss for me, but his charisma and talent is exhibited here. William Cage is a likable enough guy to get behind, and his transformation from a shaken and unsure individual to a battle-experienced soldier is believable. Not forgotten is Emily Blunt as all-around hardened war veteran Rita Vrataski. If people desire less conventional female depictions in cinema, this role is a great template. Rita doesn’t need her battles to be fought, she is pretty effective herself. And yet, she needs Cage, and Cage needs her. In the process, they form a strong bond in the midst of devastation that gives the movie emotion. The rest of the cast is forgettable however except for Bill Paxton, who also brings humor as the average military tightwad. No one in J squad is memorable, and General Brigham’s (Brendan Gleeson) motives are never explained. Thankfully this is a star driven film. Edge of Tomorrow may not crank out the cash it deserves here in the U.S, but it is without question a summer experience that should keep most viewers on the edge of their seats. Photo credits go to itsartmag.com and comickbook.com. Very well said. Definitely fun, definitely worthy of more blockbuster rewards, definitely a great experience. And Liman’s decision not to cue us as to how many times Cage has lived this day is awesome. Thanks! This might be the thing I admired most about the film even with its awesome visuals and hooking score, showed that he thought highly of the audience. I actually love the J-Squad. I’ll always remember the fat guy due to his death sequence! I really liked Kick and Franz as well! Rita is an extraordinary character! If a critic has the nerve to complain how women are treated in this film…I’d like to load up my own personal mech suit and blow that critic straight to hell haha. I too laughed hard at the fat guy death lol. The squad isn’t bad to me, just there. Agreed about no one that should be complaining about Blunt’s characters…but they’re out there somewhere! Good review Jackson. This one was a lot of fun. Even if it was a gimmick we’ve seen done before, at least it still found new, exciting ways to work with it and still build a story around it. Thanks for the comment Dan. Even if repetitive, the way it was carried out was fresh. Feels good to have something that isn’t a sequel. Haven’t managed to see this one yet Jackson but it sounds like it might be worth a look. Bit surprised to see Emily Blunt in this – I usually rate her performances though so will probably give this one a try. Definitely recommended Writer! So far I believe it to be the best or to close to the best blockbuster of the year. Wow that’s high praise. Hope I manage to catch it before it leaves cinemas! I’m surprised this didn’t do better domestically too. Even Tom Cruise’s Oblivion was a bigger hit and that was awful. Edge of Tomorrow is a pretty sizable success overseas though. Movies are more global than ever before. Nice to know that it isn’t the kiss of death if a movie can’t find an audience in the US, though it would be great to still get if the movie warranted it. Tom Cruise needed to get back in the game after disappointing films Jack Reacher and Oblivion. By the sounds of things this is the film to do it. It sounds like a blast, and I love a bit of time travel! Thanks for the recommendation. Thanks for the comment Dan! Not much more I can say except that I highly recommend it!